Ghibli co-founder Hayao Miyazaki recently said that his studio's demise was "inevitable." Today, there are quotes from Ghibli producer Toshio Suzuki that are causing people to freak out, believing that the beloved animation house has decided to stop making films. People, stop freaking out. For now. Are You Worried About Studio Ghibli? Miyazaki Apparently Isn&apos;t.
Last night, Suzuki was profiled on MBS program Jounetsu Tairiku (情熱大陸). In one segment on the show, Suzuki discussed the future of Studio Ghibli, and made comments that are causing Japanese blogs and foreign sites to report that Studio Ghibli is closing down its production department. The source for the story in English is a Ghibli fan Tumblr, which simply states that Toshio Suzuki "announces" the closure of Studio Ghibli. The Tumblr site has a series of images, featuring Suzuki and his comments. These comments, however, were not translated. So, let's look at Suzuki's comments and translate them. These images are from Japanese blog Someone One One!! Kotaku has yet to see the full Jounetsu episode to confirm. "We're thinking about disbanding the production department and.."
"...making a big change to the larger view of Studio Ghibli." "'Restructure' is called saikouchiku (再構築) in Japanese." (in yellow) Note that "saikouchiku" means "reconstruction." As pointed out on Excite News, Suzuki calls this "spring cleaning" or a "major cleaning" (大掃除 or ooshouji), using the restructuring to improve the environment for the next generation. Suzuki says this has been considered for a while. "Obviously, Miyazaki's retiring was quite significant." "After that, what should Ghibli do?" "With that, continuing to endlessly create like this..."
"once, right about now, we will take a short rest and think about what's next." Just a note: the wording Suzuki uses ( 小休止 or "shoukyuushi") can mean "pause" or "a break" or a "breather." He does not use the more definite word "kyuushi" (休止), which means either "stop, pause or suspend." Suzuki's wording makes it sound like the studio is considering reorganization and regrouping. It could mean that Studio Ghibli decides it won't make anime films anymore. Though it could mean they do keep making anime films. It could mean a lot of things! Realize that, at the time of writing, no major Japanese newspaper is running this story. Nor did any morning TV shows. Had Studio Ghibli - a national treasure - definitively ceased production of films, it would be headline news around the country, as it would be important in both the entertainment and business worlds. 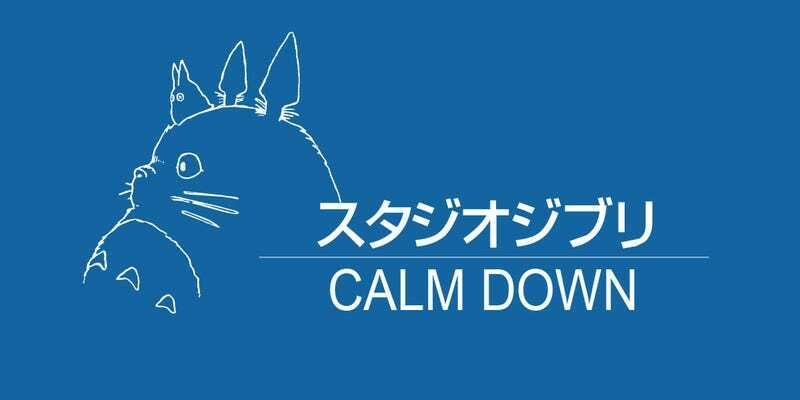 Last month, Kotaku first reported a Japanese rumor that claimed Studio Ghibli was shutting down it's anime production department. Today's confusion could have stemmed from this older report. So, what's the future of Studio Ghibli? Who knows. Studio Ghibli might not even know. But that's probably what this breather is for: to figure things out. For the time being, at least, no final decisions have been made.